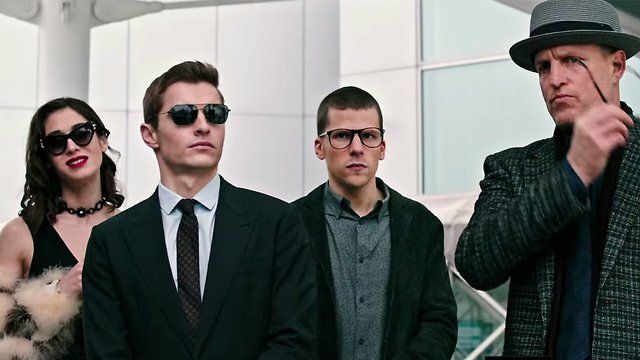 'Louis Leterrier's Now You See Me split critics, and I found myself on the short end with those who found it rather enjoyable. Of course the combination of stage magic and a caper story was all but tailor-made to appeal to my tastes. It may not have been the tightest plot around, but Leterrier delivered a romp that, like a carnival ride, kept going around even when any grounding in logic fell away. But, as any ride must, it came to an end. Given how heavily the first movie relied on its own momentum, even a fan like me was skeptical at the prospect of starting things up again for a sequel. Indeed, Jem director Jon M. Chu struggles to recapture Leterrier's magic in Now You See Me 2, but the whole thing never quite gets back off the ground. It's three years since the breakout spectacle of The Four Horsemen, and they're tired of living in the shadows, waiting for the mysterious magicians' guild The Eye to bring them further into the fold. 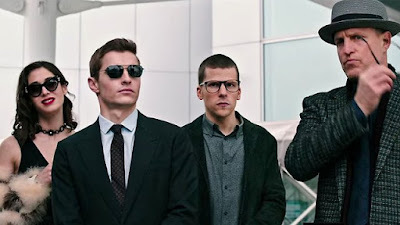 Danny Atlas (Jesse Eisenberg) in particular feels like their secret sponsor FBI agent Dylan Rhodes (Mark Ruffalo) is slow-walking their next steps. Merritt (Woody Harrelson) and Jack (Dave Franco) are getting antsy themselves; Jack even more so since he'd faked his own death and must still keep up the facade of, you know, not existing. Henley even gave up entirely, thus explaining Isla Fisher's departure. In her place we have Lula (Lizzy Caplan), who's been working the "underground" magic scene that specializes in gorier fare, all guillotines and ripping doves in half -- all an illusion, of course. Dylan recruited her and decided she's now part of the group, but Danny doesn't like her. It's never quite clear why, though, other than just ego and change-aversion on his part. But it does echo the problems with the movie as a whole: swapping out pieces, coasting on past achievements, and expecting things to work as smoothly as they did before. And just like the movie, things don't go as planned. An attempt to disrupt a tech company's product launch, exposing it as a secret spy-on-everyone network, goes awry. 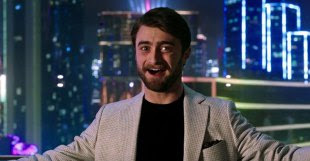 The four flee, but find their escape re-routed to Macau, where wealthy and secretive brat Walter Mabry (Daniel Radcliffe) demands they steal a magic computer chip to clear their names. Meanwhile Dylan's FBI cover is blown, and he has to enlist the aid of his old rival Thaddeus Bradley (Morgan Freeman) to help find the group himself. There are two different approaches to misdirection: control and confusion. For most of the first movie, Leterrier exercised a disciplined control over our attention, steering it so carefully that we wouldn't even notice that it was being directed. And I use that word specifically; in any film what a director is actually directing is attention, and the best can do it so subtly that most audiences won't even notice that it's happening. It was only towards the end, once he already had us hooked, that Leterrier switched to confusion. Lights and colors and action swirl, keeping us off-balance and distracted from the mechanism of the trick. Chu, on the other hand, starts out with a lot of balls in the air, and proceeds to add more. So many moving parts makes the plot ungainly, and more difficult to control precisely. The timing is off. Feints are telegraphed. Seams come loose. An offhand line suggests a character knows more than they logically should at that point. Is it a clue? no, just a sloppy point in the script. It's not that films must be perfectly executed down to the smallest jot and tittle. Cinematic nitpickery is the laziest form of criticism, but pulling off caper flicks like these takes fanatical attention to detail. Leterrier had it, and even then it didn't work for half the critics. Chu's timing is always just a little off, and while that wouldn't normally bring a movie down, it's enough to keep this one from taking off.